Photographs of a coated pit and an endocytotic vesicle are shown in Figure 1-20. Recent evidence suggests that the coated vesicle forming is a molecular filter, accounting for the selectivity of the contents. 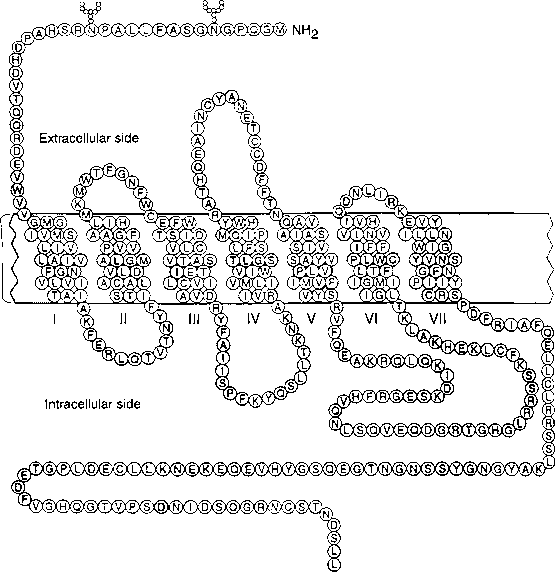 Diameters of coated vesicles are in the range 50-150 nm. Coated vesicles from adrenal medulla are shown in Figure 121. The major protein component of the coated vesicle is clathrin, a nonglycosylated protein of molecular weight 180,000. 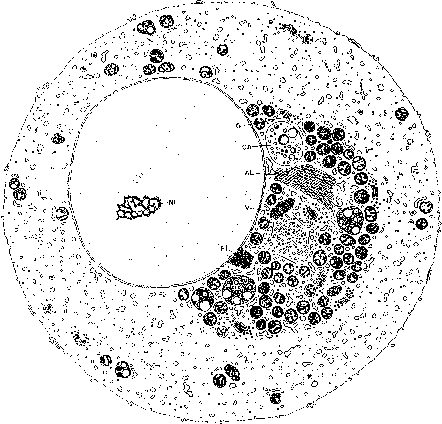 Its primary sequence appears to be highly conserved. Clathrin makes up 70% of the total protein of coated vesicles; 5% is made up of polypeptides of molecular weight about 35,000, while various other polypeptides of molecular weight 50,000-100,000 are present. Coated vesicles have a remarkable surface structure resembling a lattice comprising hexagons or pentagons. Three clathrins probably contribute to each polyhedral vertex and two clathrins contribute to each edge. Thus, the smallest structures would contain 12 pentagons plus 4-8 hexagons with 84 or 108 clathrin molecules. A 200-nm diameter coated vesicle would have about 1000 clathrin molecules. Clathrin can form flexible lattices to act as scaffolds to form vesicles during budding. Actual electron micrographs of the budding vesicle are shown in Figure 1-21. By this mechanism, the ligands in the vesicle are delivered to the lysosome and degraded. Some specially active degradation products or the intact hormone itself may emerge to promote the long-term effects of the original polypeptide hormone. Alternatively, long-term effects may occur through the activities of second messenger molecules generated by action at the cell membrane.